Yesterday started early since my ewe lambs needed loading from our corral to the paddocks they will stay in for grazing. I’d never loaded sheep out here before, so hadn’t a clue how it would go. Incredibly, it went very smoothly! They hopped right into the trailer and off we went. They were hungry to be sure since they went straight to grazing once out of the trailer. Then Dallas and I loaded a bit of hay in my little trailer pulled by the Gator, loaded necessary supplies, and fueled up. Arriving at Tannachton Farm 35 minutes later, we unloaded the hay and checked on the ewe that had been entangled in the fence. She is still alive and we cared for her best we could, but time will tell if she’ll ever get up again. At least it was warm yesterday, but snow today!. We set up a bit over a quarter of a mile of single strand polywire on the Bowyer Place and hung a Parmak energizer to fire it up, all the while calling the cows, so they would be up waiting and ready to move. We then set up the crossing for the move across Cord Drive. Amazingly, the cows and calves poured across the road to fresh grass. I was short some Stafix step-in posts for the polywire, so once the cows were moved across and in the lot, we drove back to where some stored posts. As we were collecting those, I noticed a black cow north of the timber, so once done, we circled ’round to check. What a wonderful surprise! Not just one cow having calved, but THREE right there together. They had wisely selected a south-facing, gentle slope with good drainage. Of course, we left them alone – I’ll move them later when their calves are older and well-bonded to their mommas. 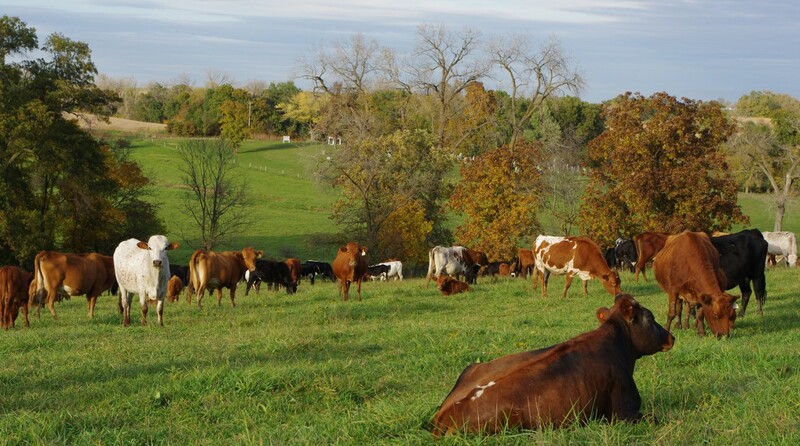 My photo is misleading – we do not have grass that green right now and the cows were actually moving the other direction! However, I didn’t have any time to take photos so this one is stolen from last spring. Got done and headed back home arriving about 1pm. Just in time to finish the meal for our departure at 4pm to Mexico, Missouri and Refuge Ministries. Despite having some cooking disasters, I managed to show up with enough edible tucker to serve about 70 people! Chicken-Rice-Vegetable casserole with cherry cobbler and pumpkin bread. And, of course, sliced cucumbers with home-made ranch dressing.